Heat oven to 375°F. Cook ground beef in 10-inch skillet until thoroughly cooked, stirring frequently. Drain. Stir in taco seasoning mix, water and olives. Simmer 5 minutes. Meanwhile, separate crescent dough into 8 triangles. Place triangles in ungreased 9 or 10-inch pie pan, pressing to form crust. Sprinkle 1 cup of the corn chips over bottom of crust. 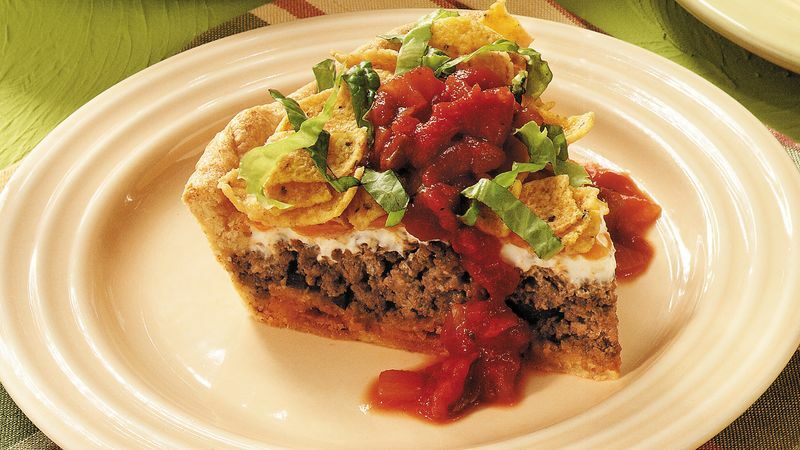 Spoon beef mixture into corn chips in crust. Spread sour cream over beef mixture. Cover with cheese. Sprinkle with remaining 1/2 to 1 cup corn chips. Bake at 375°F. for 20 to 25 minutes or until crust is golden brown. Cut in wedges. Serve immediately with lettuce and avocado. Store in refrigerator. To make ahead, assemble pie and cover with foil; refrigerate up to 2 hours before baking. Uncover; bake as directed above. To reheat, bake, uncovered, at 350°F for 10 to 15 minutes or until hot.